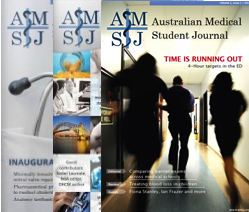 To provide a medium for Australian medical students to publish their work and share ideas with their peers. To provide a suitable forum for students to make the transition between assignment-writing and producing publishable academic work. To inform students about medical topics and issues not typically addressed in core curricula. To facilitate discussion of current issues relevant to medical students. To allow Australian medical schools to showcase the research aspects of their programs. To provide a further incentive for students to produce high-quality work in their studies. To foster the next generation of Australian medical researchers and physician-scientists. To provide an avenue for students interested in a career in medical editing or publishing to pursue this interest as a student staff member.